VisionTech Angels’ Executive Director Ben Pidgeon recently sat down with Robb Monkman, co-founder and CEO of React Mobile, to learn more about the company that’s dedicated to protecting people working in the hospitality industry from on-the-job assault, harassment and other dangers, Robb will be presenting React Mobile, a SaaS platform, during VisionTech’s upcoming Pitch Week, April 15-18. Read on! BP: What motivated you to found React Mobile? RM: When I was in college, I lived off campus with roommates. One night, two guys with guns broke into our apartment, held guns to our heads and robbed us. I was literally frozen; there was no way to call for help. That led me to create an app college students could use for emergencies. Since then, the app has grown into a powerful enterprise platform that gives people from all walks of life – at universities, in business environments and now the hospitality industry – a way to call for help. Ultimately, my partners and I are motivated to make the world a safer place. BP: You started at universities and then moved to hotels and resorts. What attracted you to the hospitality industry? 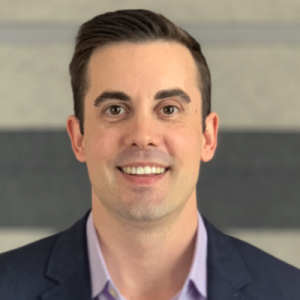 RM: It’s simple: the obvious need for personal safety and increasing acknowledgement and action by lawmakers and leaders in the hospitality industry that the issue of employee safety has to be addressed. Here’s a quick fact for you: more than half of hotel workers, primarily housekeeping staff, face harassment and assault on the job. And it happens every day! Laws are now being passed to implement panic buttons for hospitality employees. React Mobile’s hometown, Seattle, was among the first in the country to pass a law. New York, Chicago, Miami, and other major destination cities have passed similar laws. They’re serious, too. Failure to comply could result in a hotel having their license revoked, fines and/or increased liability insurance costs. The hospitality industry has also addressed the problem, creating the 5 Star Promise to provide panic buttons to all employees by 2020 to keep people safe should they encounter any threat on the job. This initiative is backed by the top 19 brands, including Hilton, Marriott and Disney Resorts, for a total of more than 18,000 properties. BP: Explain how React Mobile works. RM: The React Mobile platform utilizes both GPS geolocation and blue tooth beacon technology that allows hotel security to pinpoint the whereabouts of employees in real time down to a specific room when a distress call is received. It works equally well in a high-rise property as is does in a sprawling casino property. Should a distress call be off-property on a golf course or in a pool area for example, we provide exact GPS coordinates for Google map tracking. React Mobile is cloud-based and integrates with the leading hotel platforms, making it easy to install. Finally, React Mobile is not a one-size-fits-all solution. Hotels can choose from several solutions. BP: I know this is intended for employee safety, but it could protect guests as well. RM: Absolutely! The sniper at the Mandalay Bay in Las Vegas in 2017 was an eye-opener for the industry. After that incident, employees were afraid to go to work. They never know what they’re going to find behind a hotel door. 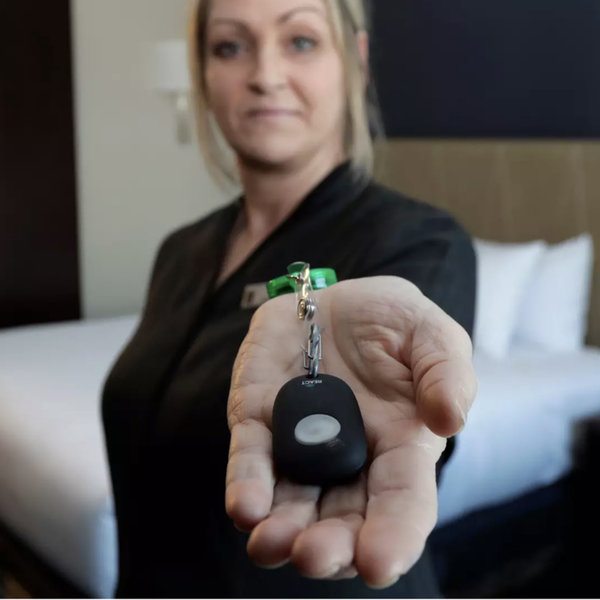 The unions began to pressure hotels to provide employees with panic buttons. I am proud to say that React Mobile was the first solution to be deployed on the Vegas strip. BP: Tell me about the market. Is there an ideal customer? RM: The market for React Mobile is huge; any hotel would benefit from our panic button solution. Our technology is particularly well suited for multi-story buildings, multi-building properties and golf, ski and other themed resorts. Currently, our focus is the major brands due in part to their commitment to implementing employee panic buttons by 2020. BP: What’s your traction look like? RM: It’s an exciting time for React Mobile. We have nearly 150 properties under contract and are a preferred vendor with a number of top brands, including Choice Hotels, Best Western Caesar’s Entertainment, Accor Hotels, and the Sands, owner of the Venetian in Las Vegas. We recently won an RFP with a major theme park company. We have a huge opportunity with hotel management groups and aggregators. BP: What’s your revenue model? RM: React Mobile is sold as a software-as-a-service, but we have three revenue streams: hardware that includes the Bluetooth beacons and panic buttons; recurring service fees based on room counts; and lastly, installation and onsite training. BP: What’s your exit strategy? RM: It’s fairly clear-cut. An acquisition partner would likely come from one of our integration partners or someone in the security industry. BP: Why should VisionTech Angels invest in React Mobile? RM: We have serious traction—almost 20,000 hotels are committed to implementing panic button technology. As one of the firsts in the space, we’ve built a strong foundation and our platform is easy to implement as it integrates with current security platforms. We’re trusted by large hotels, casinos and resorts. The 2020 implementation deadline is almost here. All we need is rocket fuel for our growth to take off. To learn more about React Mobile, visit their website. 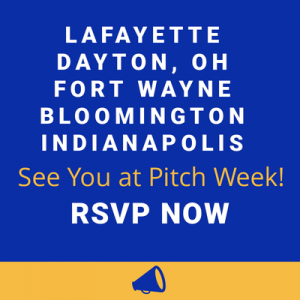 For details on VisionTech Angels’ April Pitch Week, visit our events calendar.